If in all ideology men and their circumstances appear upside-down as in a camera obscura, this phenomenon arises just as much from their historical life-process as the inversion of objects on the retina does from their physical life-process. In direct contrast to German philosophy which descends from heaven to earth, here we ascend from earth to heaven. That is to say, we do not set out from what men say, imagine, conceive, nor from men as narrated, thought of, imagined, conceived, in order to arrive at men in the flesh. We set out from real, active men, and on the basis of their real life-process we demonstrate the development of the ideological reflexes and echoes of this life-process. The phantoms formed in the human brain are also, necessarily, sublimates of their material life-process, which is empirically verifiable and bound to material premises. One of the first posts of this blog was The Cartesian Theater: philosophy of mind versus aerography, where I use the article “All that is landscape is melted into air: the `aerography’ of ethereal space”, Environment and Planning D: Society and Space 2011, volume 29, pages 519 – 532 by Olwig in order to argue that the Cartesian Theater notion of Dennett is showing only one half of the whole homunculus fallacy. Indeed, Dennett’s theater is a theater in a box, the invention of Inigo Jones, already designed around the king (or homunculus, in Dennett argument), using geometrical perspective for giving an appearance of reality to an artificial construct, the scenic space. With any homunculus, I argue, comes also a scenic space, which has to be taken into account in any theory of mind, because it is as artificial, it leads to the same kind of fallacy as the homunculus. In the posts Towards aerography, or how space is shaped to comply with the perceptions of the homunculus and Theatron as an eye I further develop the subject by trying to see what becomes the homunculus fallacy if we use not the theater in a box, but the old greek theater instead (and apparently it seems that it stops to be a fallacy, as homunculi and designed scenic spaces melt into oblivion and the gnomon, the generator of self-similarity, comes to the attention). Finally, in the post On the exterior homunculus fallacy I argue that the original homunculus fallacy is not depending on the fact that the homunculus is inside or outside the brain, thus leading me to suppose that the neuroscientist which studies a fly’s vision system is an exterior homunculus with respect to the fly and the lab is the scenic space of this homunculus. It means that any explanation of the fly vision which makes use of arguments which are not physically embedded in the fly brain (like knowledge about the euclidean structure of the space) makes sense for the experimenter, but cannot be the real explanations, because the fly does not have a lab with a small homunculus inside the head. Which brings me to the relation with ideology, which is more than a given point of view, is a theater in a box which invites the infected host to take the place of the homunculus, watch the show and make an opinion based on the privileged position it occupies. But the opinion can be only one, carefully designed by the author of the ideology, the scenographer. The scenic space needs an Inigo Jones, Inigo Jones is the ignored dual of the homunculus-king. He does not use magic in order to organize the show for the king, but he adds meaning. In the case of an ideology (a word which has as root a greek word meaning “to see”, thanks again to Olwig for this) the added meaning is intentional, but in the case of a neuroscientist which experiments on the vision system of a fly (what a king) it is unintended, but still present, under the form of assumptions which lead the experimenter to an explanation of the fly vision which is different from what the fly does when seeing (likely an evolving graph with neurons as nodes and synapses as edges, which modifies itself according to the input, without any exterior knowledge about the experimenter’s lab and techniques). A step for making something analogous to the Holliday junction, such that it is related to the Chemical concrete machine minimal formalism, is to make a full zipper. Let’s play with it. I shall use two ingredients, which function only by using the graphic beta move, so I shall NOT use the FAN-IN move. zippers, this time written with the conventions of the Chemical concrete machine minimal formalism. 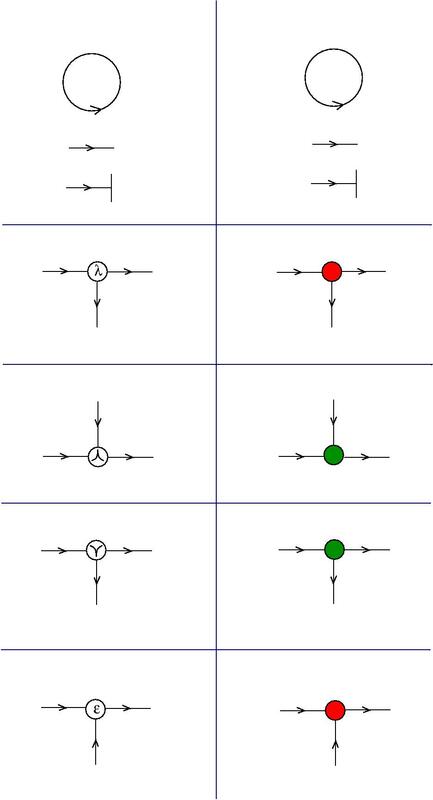 Now, if we want the numbering 1-1′ 2-2′ 3-3′ to make sense, we may add arrows, the green and red ones. But mind you, we could also add graphs with one input and one output instead of each green or red arrow. As usual, the colours are just a visual help, they mean nothing in the formalism. 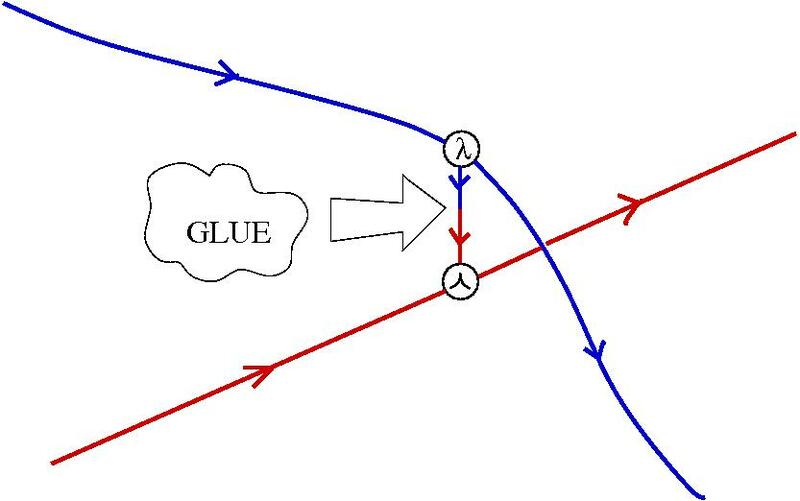 Is just a play, but for the moment, since it’s holiday season, I like to think about the green and red arrows (in fact about their replacements by graphs with one input and one output) as being the letters A, C, G, T. Of course, it might mean nothing, let’s see, it’s just a vague hypothesis. Left for play: draw a Holliday junction. If we think about a homunculus outside the brain, the homunculus fallacy still functions. This post continues the Vision theater series part I, part II, part III, part IV, part V, part VI and also links to the recent Another discussion about computing with space . The homunculus argument is a fallacy arising most commonly in the theory of vision. One may explain (human) vision by noting that light from the outside world forms an image on the retinas in the eyes and something (or someone) in the brain looks at these images as if they are images on a movie screen (this theory of vision is sometimes termed the theory of the Cartesian Theater: it is most associated, nowadays, with the psychologist David Marr). The question arises as to the nature of this internal viewer. The assumption here is that there is a ‘little man’ or ‘homunculus‘ inside the brain ‘looking at’ the movie. The reason why this is a fallacy may be understood by asking how the homunculus ‘sees’ the internal movie. The obvious answer is that there is another homunculus inside the first homunculus’s ‘head’ or ‘brain’ looking at this ‘movie’. But how does this homunculus see the ‘outside world’? In order to answer this, we are forced to posit another homunculus inside this other homunculus’s head and so forth. In other words, we are in a situation of infinite regress. The problem with the homunculus argument is that it tries to account for a phenomenon in terms of the very phenomenon that it is supposed to explain. Suppose instead that the homunculus is outside the brain. Why, for example think about the experimenter doing research on your vision. The fallacy functions as well, because now we have another homunculus (outside the brain) who looks at the movie screen (i.e. the measurements he performed on your visual system, in the medium controlled by him). “But how does this homunculus see the ‘outside world’?” Infinite regression again. at least. Suppose that the experimenter says: “to the subject [i.e. you] was presented a red apple, at distance , at coordinates . By the physical laws of opticks and by the geometrical setting of the controlled lab we know that the sensor of the retina of the left eye was stimulated by the light coming from the apple. We recorded a pattern of activity in the regions of the brain, which we know from other knowledge (and statistical assumptions) that is busy with recognition of fruits, is involved in contour recognition and with memories from childhood.” I agree that is a completely bogus simplification of what the real eperimenter will say, but bear with me when I claim that the knowledge used by the experimenter for explaining how you see the apple has not much to do with the way you see and recognize the apple. In the course of the explanation, the experimenter used knowledge about the laws of optics, used measurements which are outside you, like coordinates and geometric settings in the lab, and even notions from the experimenter’s head, as “red”, “apple” and “contours”. Should the experimenter not rely on physical laws? Or on geometrical asumptions (like the lab is in a piece of euclidean 3d space)? Of course he can rely on those. Because, in the case of physical laws, we recognize them as physical because they are invariant (i.e. change in a predictable way) on the observer. Because in the case of geometrical assumptions we recognize them as geometrical because they are invariant on the parametrization (which in the lab appears as the privilege of the observer). But, as it is the case that optics can explain only what happens with the light until it hits the retina, not more, the assumptions in the head of the experimenter, even physical and geometrical, cannot be used as an explanation for the way you see. Because, simply put, it is much more likely that you don’t have a lab in the head which is in a euclidean space, with an apple, a lamp and rules for measuring distances and angles. You may say that everybody knows that apples are not red, that’s a cheap shot because apples scatter light of all frequencies and it just happen that our sensors from the retina are more sensible at some frequencies than other. Obvious. However, it seems that not many recognize that contours are as immaterial as colors, they are in the mind, not in reality, as Koenderink writes in Theory of “Edge-Detection” JJ Koenderink – Analysis for Science, Engineering and Beyond, 2012. The explanation of vision which uses an exterior homunculus becomes infinite regression unless we also explain how the exterior homunculus thinks about all these exterior facts as lab coordinates, rational deductions from laws of physics and so on. It is outrageous, but there is no other way. Let’s forget about experiments on you and let’s think about experiments on fly vision. Any explanation of fly vision which uses knowledge which is not, somehow, embodied in the fly brain, falls into the (exterior) homunculus fallacy. So what can be done, instead? Should we rely on magic, or say that no explanation is possible, because any explanation will be issued by an exterior homunculus? Of course not. When studying vision, nobody in the right mind doubts about the laws of optics. They are science (i.e. reproducible and falsifiable). But they don’t explain all the vision, only the first, physical step. Likewise, we should strive for giving explanations of vision which are scientific, but which do not make appeal to a ghost, in the machine or outside the machine. Up to now, I think that is the best justification for the efforts of understanding space not in a passive way. In this post I want to prove that only with arrow molecules and enzyme moves we can generate all we need for the chemical concrete machine, by using the minimal (?) formalism from Chemical concrete machine, short list of gates and moves . This is done with the help of ideas from the old post Ancient Turing machines (I): the three Moirai, which contains a discussion about generating moves for graphic lambda calculus. 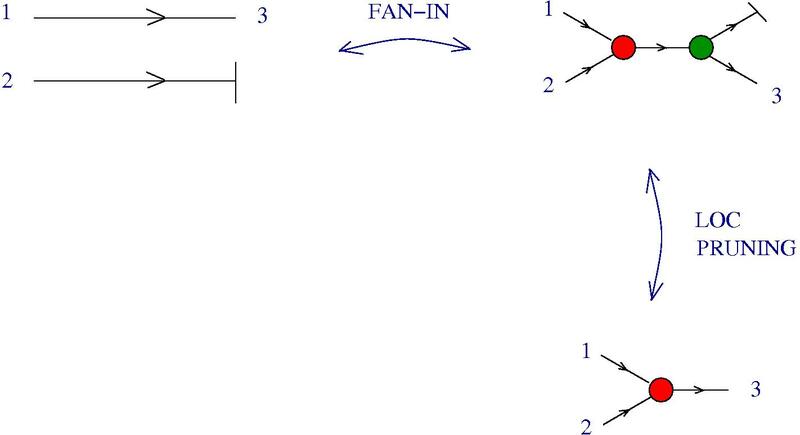 In the post Local FAN-IN eliminates GLOBAL FAN-OUT (II) , at the end, I prove a switch move from CO-COMM and FAN-IN moves. In the next figure, I call this move (which is, recall, a “macro move”, made by a succession of three moves) SWITCH. In the same figure appears a move CREA’. The name is justified by the resemblance with the CREA move proposed in Ancient Turing machines (I): the three Moirai . Before giving the proof of CREA’, let me remark that from these macro moves, together with the ones selected in the post Chemical concrete machine, short list of gates and moves , we can recover all the generating moves of the three Moirai described in the ancient Turing machine post. For example, CREA’ , used for a triple of arrows, gives both the Clotho’s CREA original move and the Atropos GARB move. From a bag of arrows at our discretion, this move gives us fan-out gates and termination gates. 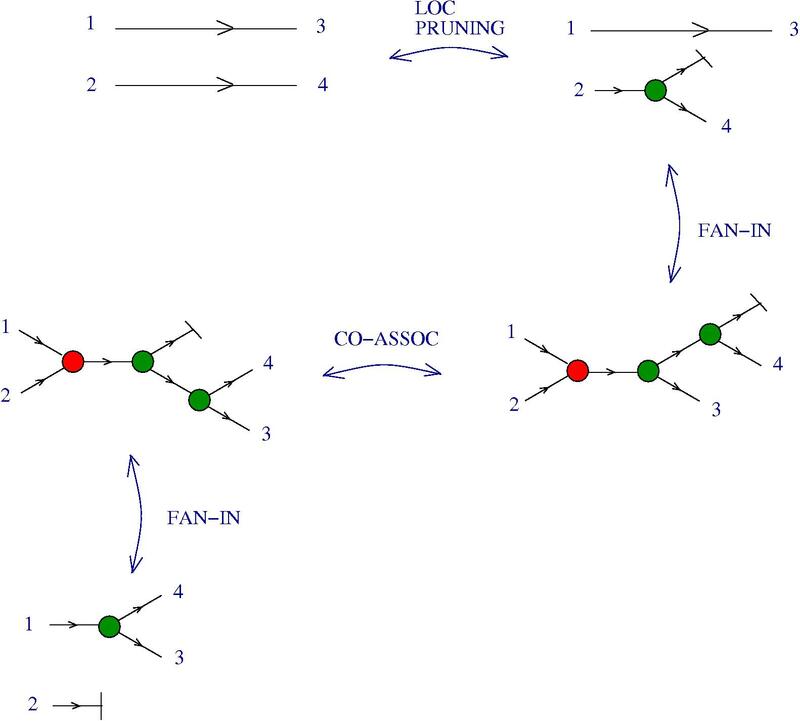 Moreover, it is pleasant to see that, as the SWITCH move is a consequence of CO-COMM and FAN-IN, the CREA’ move is a consequence of CO-ASSOC and FAN-IN. 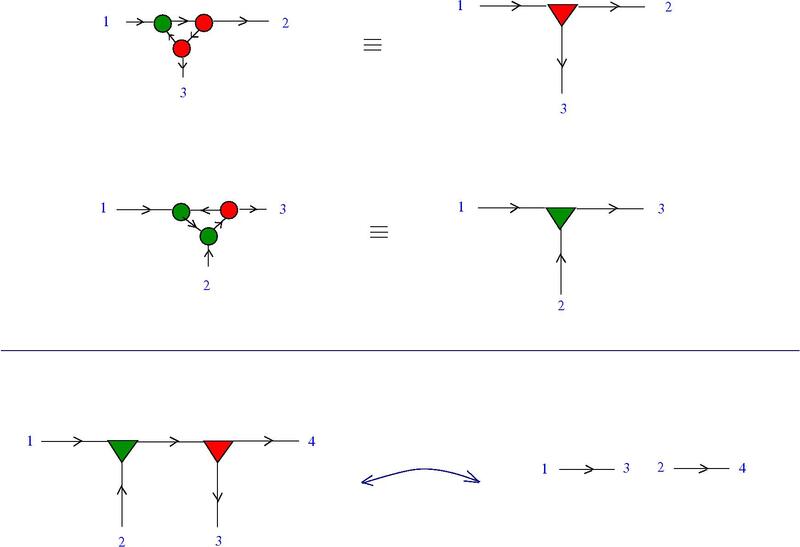 We need the other three trivalent gates, let’s see how we can obtain them (generate them from arrows, by using moves, recall that moves are enzymes, in the world of the chemical concrete machine). The lambda abstraction and application gates can be generated by using the graphic beta move and a SWITCH move. Now we have all the gates we need and we can proceed to constructing whatever combinator we want from them, mainly by using SWITCH moves. One elegant way for doing this would be to construct zippers first, by using the graphic beta moves, then construct the S,K,I combinators from zippers, as indicated in Combinators and zippers. 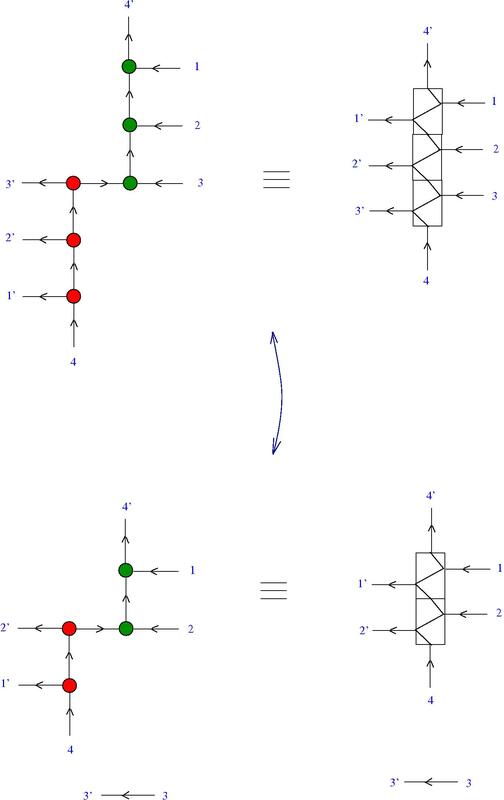 Probably, the real chemical concrete machine will function with terms (molecules) created by some more natural chemistry tricks, but it is pleasant to see that in principle we can also construct what we need, before passing to the “computation” part, only by using arrows and moves. Computing with space vs space computing. Space (real space, we all share) is not made of points. A point is an abstraction, the unattainable goal of a thought experiment, an atom of thought. Or a string of numbers (when we think with coordinates). Quantum physics tells us we can’t perform, even in principle, a physical experiment with the goal of exactly localizing the position of an object in space. That’s pop philosophy. It might even be wrong (for example what quantum physics tells us is that we can’t perform physical experiments for localizing a particle in the phase space (position, momentum), not in the real space, whatever that means. That’s also the turf of theoretical physicists, there are several, with various degree of mathematical soundness, theories about the structure of space. I shall not go in this direction, further. Instead, I want to make a case for a biology inspired point of view. I made it before, repeatedly, starting with More than discrete or continuous: a bird’s view, but now I have a bit more tools to tackle it, and a bit of more patience to not hurry to conclusions. So, if you prefer the red pill, then read this. Can you think about space in terms of what it does, not what it is? Can you describe space as seen by a fly, or by a toddler, or you need to stick to cartesian conventions and then fall into the trap of continuous vs discrete, and so on? So, after this motivating example, I state my hypothesis: whatever space is (and that’s a very hard and old problem), let’s not think about it passively (like a robot fly which is driven by some algorithms which use advanced human knowledge about euclidean geometry, systems of coordinates and the laws of mechanics) as being a receptacle, a something. Let’s think about space as described by what you can do in it. The fly, for example, cannot possibly have a passive representation of space (and for us is the same) in the brain, but it does have the possibility to manipulate it’s actuators as a function of what it sees (i.e. of what it’s receptors perceive and send further to the brain) and of the state of it’s brain (and maybe on the history of that state, i.e. memory, stored in a mysterious way in the same tiny brain). However, actuators, sensors, brain and the environment are just one system, there is no ghost in, or outside that fly machine. My hypothesis is that for the fly, that’s space. For us is the same, but we are far more complex than the fly. However, deep in our brains there are “patterns” (are they assemblies of neurons, are they patterns of synaptic activity, is it chemical, electric, …?) which are very basic (a child learns to see in the first months) and which are space, for us. Now I’ll get mathematical. There are spaces everywhere in math, for example when we say: that’s a vector space, that’s a manifold, or even this is a group, a category, and so on. We say like this, but what we actually have (in the mind) is not a manifold, or a vector space, a group or category, but some short collections of patterns (rules, moves, axioms) which can be applied to the said objects. And that is enough for doing mathematics. This can be formalized, for example it’s enough to have some simple rules involving gates with two inputs and an output (the dilations) and we can prove that these simple rules describe all the concepts associated to any vector space, for example. and moreover not using at any moment any external knowledge. A dilation is simply the pattern of activities related to map making. So, according to my hypothesis, a generic vector space is this collection of rules. When it comes to the dimension of it, there are supplementary relations to be added for being able to say that we speak about a 3d vector space, but it will be always about a generic 3d vector space. There is no concrete 3d space, when we say, for example, that we live in a 3d space, what we really say is that some of the things we can do in a generic 3d space can also be done in reality (i.e. we can perform experiments showing this, although there are again studies showing that our brain is almost as bad as concerns perceiving relations in the real space which correspond to theorems in geometry, as it is when we force it to do logic reasonings). Conclusion for this part: there may be or not a passive space, the important thing is that when we think with space and about space, what we really do is using a collection of primitive patterns of thought about it. Now, going to the Turing machine, it lacks space. Space can be used for enumeration, for example, but the Turing machine avoids this by supposing there is a tape (ordered set). It is proved that enumeration (i.e. the thing which resembles the most with space in the world of Turing machines) does not matter in the sense that it can be arbitrarily changed and still the conclusions and definitions from the field do not change. This is alike saying that the Turing machine is a geometrical object. But there is no geometrical description of a Turing machine (as far as I know) which is not using enumeration. This is alike saying that CS people can understand the concept of a sphere in terms of atlases , parametrizations and changes between those, but they can’t define spheres without them. Geometers can, and for this reason they can speak about what is intrinsically geometric about the sphere and what is only an artifact of the chosen coordinate system. In this sense, geometers are like flies: they know what can be done on a sphere without needing to know anything about coordinate systems. Principle: each gate is a molecule, each move is an enzyme. Dictionary: we need four trivalent gates, which can be distinguished one from another by looking at the number of inputs/outputs and from a choice of colour between red and green. To these add the arrows, loops and the termination gate. The translation from graphic lambda calculus notation to this new coloured notation is the following. The moves, translated. Each move is made possible by an enzyme (hence move = enzyme). Here is the list, with the names taken from graphic lambda calculus, by using the dictionary for translation. Implementation needed, but this is out of my competence. I was thinking that could be possible by using DNA origami techniques, but it might turn out that the schema here is even more close to the structure of DNA. 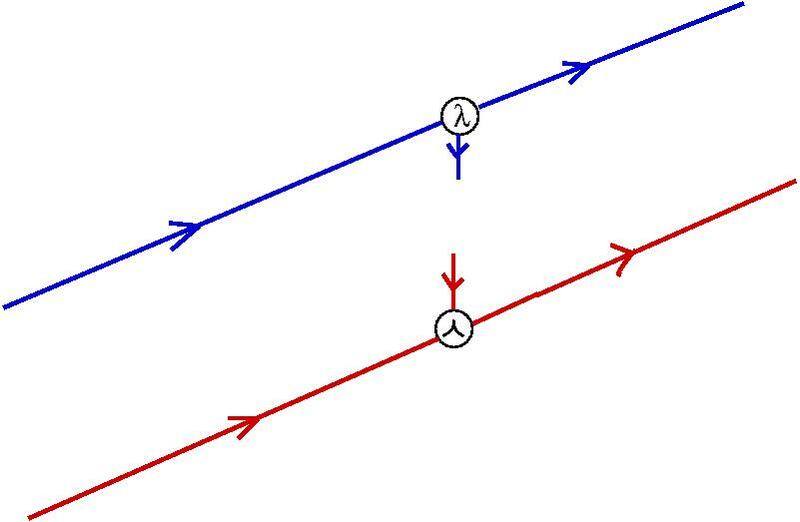 This is an outrageous speculation, but I can’t stop to remark that there are 4 trivalent gates, making two pairs of duality (seen in the graphic beta move and in the FAN-IN move), and this resembles to the A-T, G-C pairing (but it might be a coincidence). This post is partially a request for references, partially a place for possible discussions, in the comments, and partially a place for clarifications of the previous post Why build a chemical concrete machine, and how? . 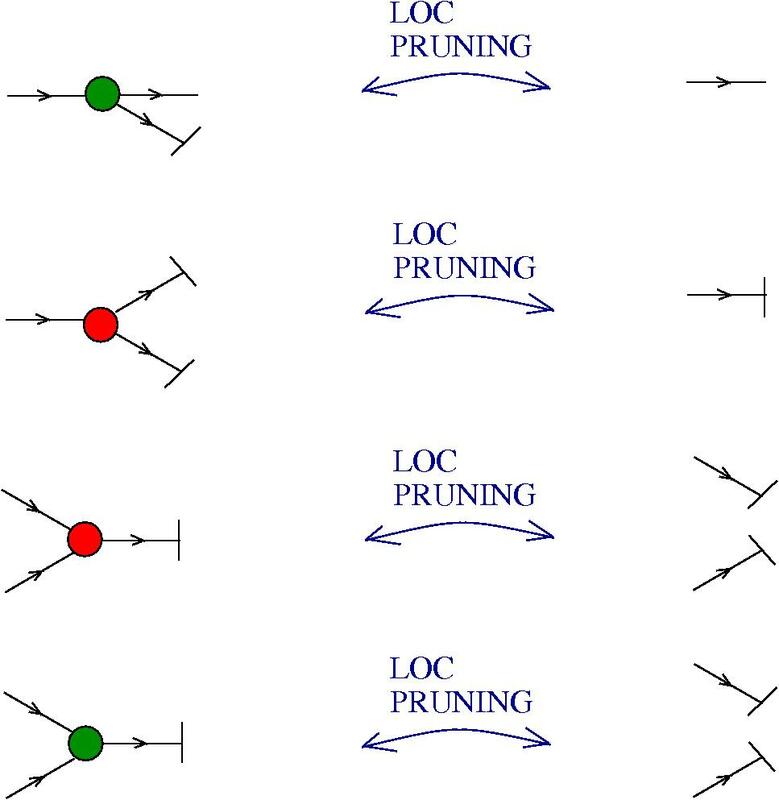 Adleman, Lipton, propose a model of DNA computing which uses exponential space, i.e. 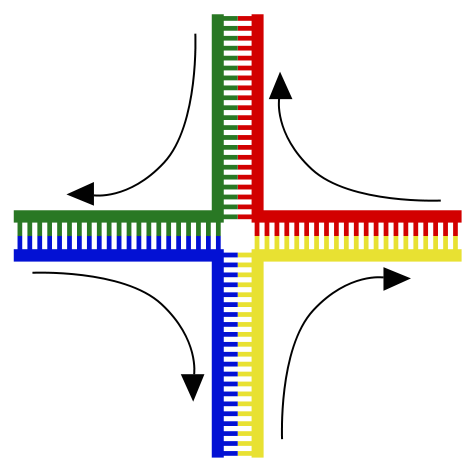 all the candidates for a solution of a combinatorial problem, each one represented by a strand of DNA, which are then filtered by a sequence of physical, or chemical manipulations of test tubes, of one of the types: separate (a tube into two others, according to the value of the variable at “i” position), merge (two tubes into one), detect. Variants (not due to Adleman, Lipton, Karp) are to add an amplify operation (like a FAN-OUT with variables) which transform a tube into two copies of it. Or (Boneh), instead of amplify, an append operation which adds a new variable with a give value. All these models have variables and are based on the mechanism of selection of the solution from an exponential sea of candidates. Hagiya, single-strand DNA computation, using a mechanism called “whiplash PCR”, which I don’t understand yet, but which has the computational power of a GOTO program. Has variables. 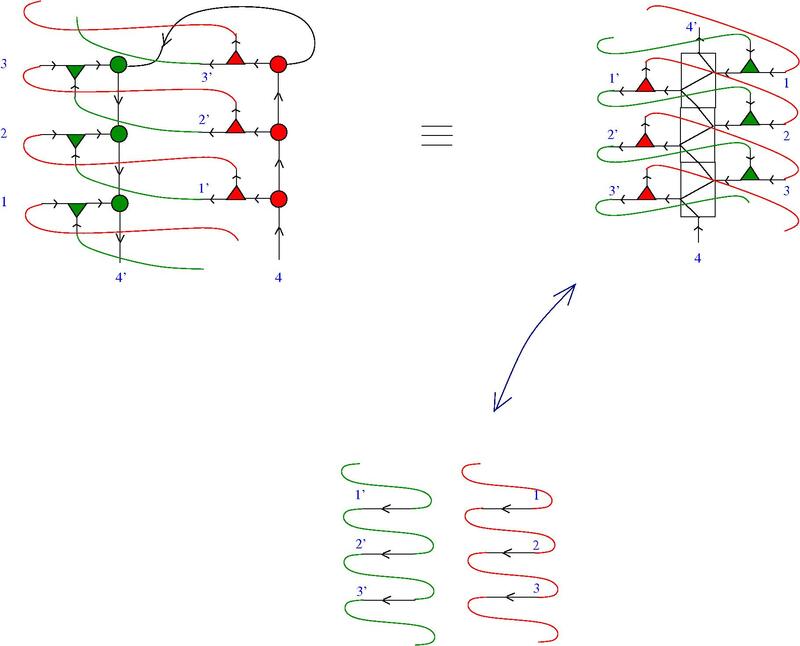 Winfree, single-strand DNA computation, but in 2D, where he proposes a “materialization” of a block cellular automaton (BCA) which has Turing universality. Has variables, tries to make a Turing machine. In the post Why build a chemical concrete machine, and how? I mentioned Turing machines, but this is obviously wrong, as can be seen by looking at the previous post A chemical concrete machine for lambda calculus. I don’t want to have a ” syringe with 10^9 nano geometrical turing machines”, no, that’s misleading, what I call a chemical concrete machine works with lambda calculus terms (among other graphs, more geometrical, from graphic lambda calculus), which are reduced by chemical reactions (using for example the graphic beta move enzyme). That’s different. 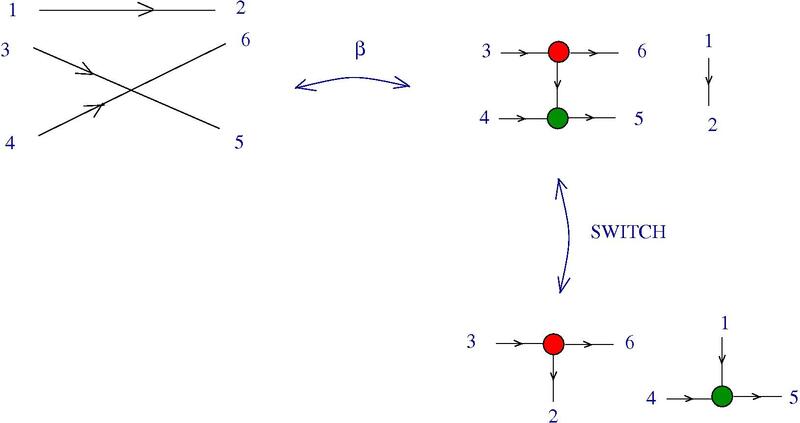 because it’s relation to crossings in knot diagrams. Recall that in the -TANGLE sector of the graphic lambda calculus, the graphic beta move appears as a SPLICE move.